Offering you a complete choice of products which include hulled sesame seeds, natural sesame seeds, sesame seeds and black sesame seeds. 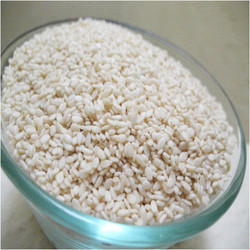 Hulled sesame seeds are considered as the most nutritious seeds because of its proteins and valuable minerals. The husk hull (skin) of these seeds are removed hence are called as hulled sesame seeds. Prior to hulling process, these sesame seeds are thoroughly cleaned. 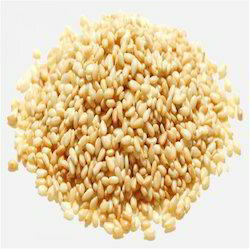 Hulled sesame seeds are relatively softer and delicious as compared to natural sesame seeds. Total Plate Count 20,000 cfu/gm max. Yeast & Mould 5,000 cfu/gm max. Sesame seeds originate from the plant Sesamum Indicum L. suitable for human consumption. Natural Sesame Seeds contain all the natural nutrients of sesame seeds. Sesame seeds have high oil content (approx. 48% min.) and protein content (approx. 25%). It is used as a spice condiment or as a garnish in many ethnic dishes and bakery items to enrich taste nutritional values. Sesame Oil is used for cooking due to its healthy properties. Sesame seeds are available as dried, oval-shaped, flat seed of the herb and extensively used as an add-on in cereals, crackers, spreads, drinks, casseroles, granola, candies, soups, salads, fish and baked goods. Our range ncludescumin seeds, fennel seeds, coriander seeds, fenugreek seeds, mustard seeds and black mustard seeds. Black Sesame Seeds from the plant Sesamum Indicum L. Suited for human consumption. Natural black sesame seeds are mainly used for medicinal purpose flavourings on various bakery products Indian cuisines.Natural Black Sesame Seed is nice crunchy texture, with a slightly bitter nutty flavour. Black sesame seeds are suitable to use with bakery products mainly bread sticks, candies, cookies, vegetables, pasta and curry dishes etc. It has also wonderful medicinal benefits and good for your overall health. It had strong aroma and very good flavor. At the same time, it is rich in fatty acids also. Black sesame seeds are rich in minerals and preferable dietary fiber item. The oil prepared using sesame seeds has a distinctive flavor and long shelf life and resists rancidity. Odour : The odour and taste are typical, product specific. The product shall be free from foreign odours and taste such as mustiness or rancidity.